^ 3.0 3.1 3.2 Commercial Airplanes – Jet Prices. www.boeing.com. Boeing. [2015-01-10]. ^ 4.0 4.1 Kingsley-Jones, Max. 6,000 and counting for Boeing’s popular little twinjet. Flight International. 2009-04-22 [2009-04-22]. ^ The Boeing 737-100/200. Airliners.net. Demand Media, Inc. [2009-04-22]. ^ 6.0 6.1 "Airbus A320 Aircraft Facts, Dates and History." 互联网档案馆的存檔，存档日期2013-01-19. Flightlevel350.com. Retrieved: May 12, 2010. ^ "The 737 Story: Little Wonder." flightglobal.com. Retrieved: January 7, 2008. ^ 9.0 9.1 9.2 9.3 9.4 9.5 9.6 Endres, Günter. The Illustrated Directory of Modern Commercial Aircraft. St. Paul, Minnesota: MBI Publishing Company. 2001. ISBN 0-7603-1125-0. ^ "Transport News: Boeing Plans Jet." The New York Times, July 17, 1964. Retrieved: February 26, 2008. ^ Civil Aircraft Today. 2006: 78. ISBN 1-84509-324-0. ^ 13.0 13.1 "German Airline Buys 21 Boeing Short-Range Jets." The Washington Post, February 20, 1965. Retrieved: February 26, 2008. ^ 14.0 14.1 Wallace, J. "Boeing delivers its 5,000th 737." Seattle Post-Intelligencer, February 13, 2006. Retrieved June 7, 2011. ^ 16.0 16.1 16.2 16.3 俞國興. 古典737 波音737-100/200特集. 臺北市: 世界民航雜誌. 2001. ISBN 957-98649-3-4. ^ 晨枫. C919品鉴：细节之中见精妙. 航空知识. 2017, (555). ^ "Type Certificate Data Sheet A16WE." faa.gov. Retrieved: September 3, 2010. ^ 20.00 20.01 20.02 20.03 20.04 20.05 20.06 20.07 20.08 20.09 20.10 Shaw, Robbie. Boeing 737-300 to 800. St. Paul, Minnesota: MBI Publishing Company. 1999. ISBN 0-7603-0699-0. ^ Civil Aircraft Today. 2006: 82-83. ISBN 1-84509-324-0. ^ Civil Aircraft Today. 2006: 84. ISBN 1-84509-324-0. ^ "To Save Fuel, Airlines Find No Speck Too Small." New York Times, June 11, 2008. ^ "UAL Cuts Could Be Omen." The Wall Street Journal, June 5, 2008, p. B3. ^ "United Airlines Press Release." 互联网档案馆的存檔，存档日期2012-02-21. united.com, July 22, 2008. ^ "Airline Shares Gain Despite Losses." The Wall Street Journal, July 23, 2008, p. B3. ^ 27.0 27.1 27.2 27.3 27.4 27.5 Kingsley-Jones, Max. "Narrow margins: Airbus and Boeing face pressue with the A-320 and 737." flightglobal.com, October 27, 2009. Retrieved: June 23, 2010. ^ 28.0 28.1 "Check Out Boeing's Swanky New High-Tech Interior." businessinsider.com. Retrieved: November 1, 2011. 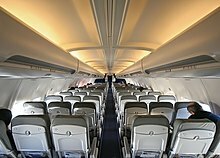 ^ "Continental Airlines Is First North American Carrier to Fly With Boeing's New Sky Interior." 页面存档备份，存于互联网档案馆 Continental Airlines, December 29, 2010. Retrieved: March 14, 2011. ^ "首架波音737－900落户深圳" sina.com.cn Retrieved: November 4, 2005. ^ "Airbus A320 Family passes the 5,000th order mark." Airbus. Retrieved: September 3, 2010. ^ "Airbus 320 Aircraft History, Information, Pictures and Facts." aviationexplorer.com.. Retrieved: September 3, 2010. ^ "Airbus orders and deliveries." Airbus. Retrieved: September 3, 2010. ^ "Boeing 737: Das meistverkaufte Flugzeug der Welt" (in German). Rhein-Zeitung, January 3, 2004. via Agence France-Presse. Retrieved: May 12, 2010. ^ Robertson, David. "Boeing gets ready for all-new 737." The Times, March 12, 2007. Retrieved: April 22, 2010. ^ Anderson and Eberhardt 2009, p. 61. ^ O’Sullivan, Matt. "Boeing shelves plans for 737 replacement." The Sydney Morning Herald, January 2, 2009. Retrieved: April 22, 2010. Quote: Boeing will stick with the 737, the world's most widely flown aircraft. ^ "Boeing airliner deliveries rise 11%." Chicago Tribune, January 4, 2008. Retrieved: April 22, 2010. ^ Layne, Rachel. "Bombardier’s Win May Prod Airbus, Boeing to Upgrade Engines." BusinessWeek, February 26, 2010. Retrieved: April 22, 2010. ^ Rahn, Kim. "B737: Best-Selling Aircraft in the World." Korea Times. Retrieved: April 22, 2010. ^ "Boeing 737 Aircraft Profile." Flight Global. Retrieved: April 22, 2010. Quote: the best selling commercial airliner in history. ^ Jiang, Steven. "Jetset: 'Tianjin Takes Off'." The Beijinger. Retrieved: April 22, 2010. Quote: A320, the workhorse of many airlines and the second best-selling jetliner family of all time (after Boeing’s venerable B737). ^ Gorman, Brian. date=2007-02 "Boeing's Continuing Climb." Motley Fool. Retrieved: May 12, 2010. ^ Kingsley-Jones, Max. "Boeing-Airbus 2007 orders race closes with 'diplomatic' finish." Flight Global, January 2008. Retrieved: May 12, 2010. ^ Cochennec, Yonn. "What goes up." Interavia Business & Technology, February 2003. Retrieved: May 12, 2010. ^ Sutton, Oliver. "Any advance on ten percent?" Interavia Business & Technology, February 2001. Retrieved: May 12, 2010. ^ "Boeing firms up 737 replacement studies by appointing team." Flight International, March 3, 2006. Retrieved April 13, 2008. ^ Hamilton, Scott. "737 decision may slip to 2011: Credit Suisse." Flightglobal, 2010. Retrieved June 26, 2010. ^ Airbus launches A320neo. Australia Aviation. December 1, 2010 [September 5, 2011]. ^ Bryan, Victoria; Jones, Rhys. Airbus wins record $18 billion order from AirAsia. Reuters. June 23, 2011 [September 5, 2011]. ^ Rothman, Andrea; Wang, Jasmine. AirAsia Tops IndiGo Record Order as Asia Dominates Air Show. Bloomberg. June 24, 2011 [September 5, 2011]. ^ O'Keeffe, Niall. "Caution welcomed: Boeing's 737 Max". Flight International, September 12, 2011. ^ 56.0 56.1 Boeing Launches 737 New Engine Family with Commitments for 496 Airplanes from Five Airlines. Boeing. August 30, 2011 [September 5, 2011]. ^ Ostrower, Jon. Boeing says 737 MAX to meet or exceed A320neo range. Flightglobal.com. [February 19, 2012]. ^ Boeing’s 737 MAX takes wing with new engines, high hopes. the Seattle Times. 2016-01-29. ^ Ostrower, Jon. Boeing designates 737 MAX family. Air Transport Intelligence. 2011-08-30 [2011-09-05]. ^ Lion Air commits to up to 380 Boeing 737s. November 17, 2011 [November 17, 2011]. ^ ACG Becomes third identified 737 MAX customer. November 17, 2011 [November 17, 2011]. ^ Southwest Airlines' Proud History of the Boeing 737. December 13, 2011 [December 13, 2011]. ^ 737 MAX commitments top 948. [December 15, 2011]. ^ Norwegian buys 222 new aircraft. E24 (Norwegian). January 25, 2012 [July 21, 2013]. ^ Copeman, Emma. Virgin Australia orders 23 Boeing 737 MAX aircraft (PDF). Virgin Australia. July 5, 2012 [July 5, 2012]. ^ Virgin Australia Orders 23 Boeing 737 MAX Aircraft. Reuters. Aviation Week. July 5, 2012 [July 5, 2012]. ^ "Boeing Gets $7.2 Bln Order From Air Lease"
^ Boeing and Air Lease Corporation Announce Order for 75 737. Boeing. ^ "United Airlines Orders 150 Boeing 737s, Including 100 737 MAX 9s"
^ Aeromexico places $11 billion order with Boeing. ^ "SilkAir signs LOI for 31 Boeing 737-8s, 23 737-800s"
^ Boeing, Avolon Finalize Order for 737 MAXs and Next-Generation 737s. ^ Bader, Tim. Gol anuncia nova compra de 60 jatos boeing 737 max. g1. October 1, 2012 [October 1, 2012]. ^ Morgan, Adam. Boeing, GOL Announce order for 60 737 MAX Airplanes. Boeing. October 1, 2012 [October 1, 2012]. ^ Gates, Dominic. Firm orders roll in for Boeing 737 MAX. The Seattle Times. October 4, 2012 [February 16, 2013]. ^ Boeing, Aviation Capital Services Announce Commitment for 35 737 MAXs. Boeing via mediaroom.com. October 30, 2012 [November 13, 2012]. ^ Boeing, ALAFCO Firms up Order for 20 Boeing 737 MAXs. Boeing via mediaroom.com. November 4, 2012 [November 13, 2012]. ^ Blachly, Linda. Aeromexico finalizes 737 MAX order. ATWOnline. November 4, 2012 [November 13, 2012]. ^ Boeing, SilkAir Finalize Order for 54 737s. Boeing via mediaroom.com. November 14, 2012 [February 16, 2013]. ^ Icelandair Group and Boeing Have Signed a Commitment for New Aircraft. Icelandair. December 6, 2012 [December 6, 2012]. ^ Boeing, Icelandair Announce Commitment for 12 737 MAXs. Boeing via mediaroom.com. December 6, 2012 [February 16, 2013]. ^ Boeing 737 MAX Gets Milestone Order from Aviation Capital Group. Boeing via mediaroom.com. January 2, 2013 [February 16, 2013]. ^ Boeing Gets $6 Billion Order for 60 737 Max Aircraft, Hits 1,000 Milestone. Frequent Business Traveler. January 2, 2013 [February 16, 2013]. ^ Boeing, Icelandair Finalize Order for 16 737 MAX Airplanes - Feb 13, 2013. Boeing via mediaroom.com. [February 16, 2013]. ^ Boeing, Turkish Airlines Finalize Order for 50 737 MAXs, 20 Next-Generation 737s. Boeing via mediaroom.com. May 14, 2013. ^ Boeing, Southwest Airlines Announce Launch of 737 MAX 7. May 15, 2013 [May 15, 2013]. ^ Boeing and TUI Travel PLC Announce Commitment for 60 737 MAX Airplanes. Boeing. May 31, 2013. ^ TUI shareholders approve 737 Max order. Flightglobal Pro. flightglobal. July 10, 2013 [July 10, 2013]. ^ Skymark Airlines Intends to Select the 737 MAX for Fleet Renewal Program. Boeing. June 17, 2013. ^ Boeing, CIT Announce Order for 30 737 MAX 8s. Boeing. June 19, 2013. ^ Boeing and Travel Service Announce Commitment for Three 737 MAXs. Boeing via mediaroom.com. June 19, 2013 [July 20, 2013]. ^ 102.0 102.1 102.2 102.3 "About the 737 Family." The Boeing Company. Retrieved: December 20, 2007. ^ "Boeing 737-200QC: The Airplane That Never Sleeps." Boeing, July 15, 2002. Retrieved: January 15, 2011. ^ Fisher, Lawrence M. "Boeing Gets Orders for 63 737-X." The New York Times, November 18, 1993. Retrieved: February 1, 2008. ^ "Alaska Airlines and Horizon Air Aircraft Information."alaskaair.com. Retrieved: June 7, 2011. ^ "Bombardier Launches CSeries Jet." The New York Times, July 13, 2008. ^ "Boeing 737-600/700." airliners.net. Retrieved June 7, 2011. ^ "Boeing 737-700 Technical Information." Boeing Commercial Airplanes. Retrieved: September 3, 2010. ^ "The 737 Story: The Long Stretch." FlightGlobal, July 2, 2006. Retrieved: April 22, 2010. ^ "Boeing 737-700ER Technical Information." Boeing Commercial Airplanes. Retrieved: September 3, 2010. ^ Boulay, Lt. Cmdr. Tim. "U.S. Naval Reserve Gets First Look at Newest Class of Aircraft." DefenseLink (U.S. Department of Defense). Retrieved: September 9, 2011. ^ Volkmann, Kelsey. "Boeing gets OK for new carbon brakes." St. Louis Business Journal via bizjournals.com. Retrieved: April 22, 2010. ^ "Boeing 737-800 Technical Information." Boeing Commercial Airplanes. Retrieved: September 3, 2010. ^ "737 family." boeing.com. Retrieved: September 3, 2010. ^ "Boeing 737-900ER Technical Information." Boeing Commercial Airplanes. Retrieved: September 3, 2010. ^ 119.0 119.1 "The Boeing 737-700/800 BBJ/BBJ2." www.airliners.net. Retrieved: February 3, 2008. ^ Boeing Completes First BBJ 3. Boeing. 2008-08-14 [2009-03-05]. ^ Boeing Introduces 737 MAX With Launch of New Aircraft Family. 2011-08-30 [2011-11-09]. ^ AIRSHOW-Boeing 737 draft orders reach 700. 2011-11-12 [2011-11-18]. Bowers, Peter M. Boeing Aircraft since 1916. Annapolis, Maryland: Naval Institute Press. 1989. ISBN 0-87021-037-8.